New and existing SAP customers can confidently deploy their mission-critical workloads on AWS knowing that AWS and SAP have worked closely to test and certify that the AWS Cloud meets the stringent performance and availability needs of SAP workloads. 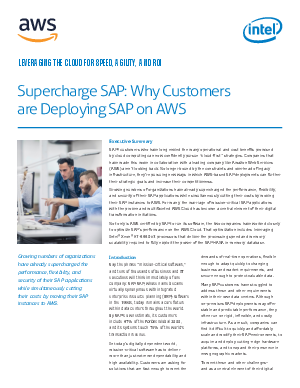 Hundreds of enterprise SAP customers run SAP solutions on AWS and are achieving increased flexibility, performance, and security, while simultaneously cutting their costs by migrating to AWS. Download our whitepaper: Leveraging the Cloud for Speed, Agility and ROI.